﻿ Hotel Alley Hua Hin, Hua Hin / Cha-am | FROM $18 - SAVE ON AGODA! Have a question for Hotel Alley Hua Hin? "Staff is friendly, we are warmly welcome"
"The room was big enough." "Hotel is simple,clean,breakfast is jz nice"
Designed for both business and leisure travel, Hotel Alley Hua Hin is ideally situated in Hua Hin City Center; one of the city's most popular locales. The excitement of the city center is only 0.5 Km away. For sightseeing options and local attractions, one need not look far as the hotel enjoys close proximity to Western Tours, Tuxedo International Tailor, Ken Diamond. Hotel Alley Hua Hin offers impeccable service and all the essential amenities to invigorate travelers. To name a few of the hotel's facilities, there are free Wi-Fi in all rooms, 24-hour front desk, Wi-Fi in public areas, car park, newspapers. Guests can choose from 16 rooms, all of which exude an atmosphere of total peace and harmony. The hotel offers fantastic facilities, including golf course (within 3 km), to help you unwind after an action-packed day in the city. 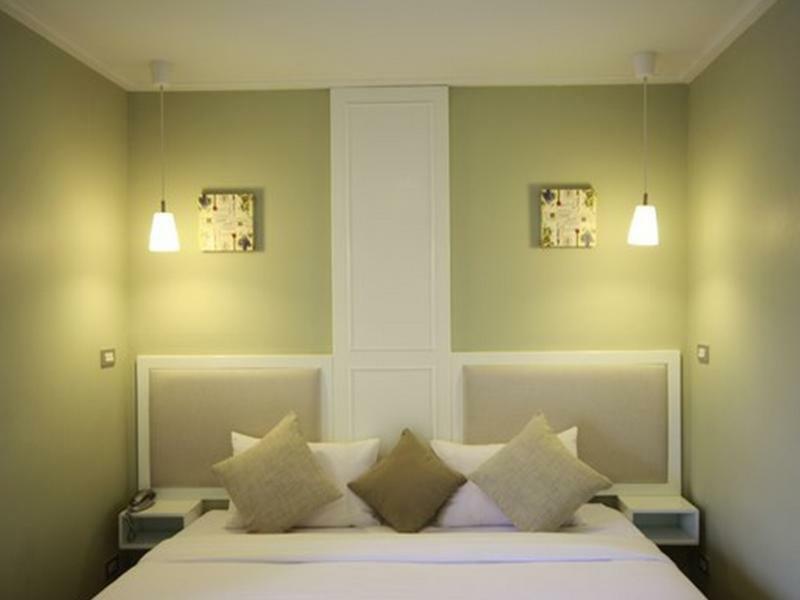 Hotel Alley Hua Hin is your one-stop destination for quality hotel accommodations in Hua Hin / Cha-am. "Great location for fast food." The matress and pillows were the star during my stay. Skip the breakfast, its a waste of space. TV reception was fuzzy. Good small balcony for drying handwashed clothes. Great location for fast food. 30 meters from Burger King and McDonald's. Wifi service not covered whole building. Our room at highest floor no wifi connection. Overall is value for money. Was good. The bed was comfy. The room was big enough. Was quiet. Hotel is basic, enough to enjoy a quiet and relaxing holiday in Hua Hin. Very close to shops, bars, restaurants and the beach...10min walk! Staff is pleasant but had one issue at breakfast; staff choose to serve the other guests first despite the fact that my lady and I ordered breakfast first. Even the couple that came down 5 minutes after us was served their breakfast before us. I was not very pleased with their service. Also, the beds are quite hard. However, the rooms are decent. As the name states the hotel is set down a small alley just off the busy main road. Easy access to train station, food choices and a 5 minute walk to the beach but very quiet and relaxing in the hotel itself. Only complaint would be the window/balcony which is blocked by a wall and the neighboring building so totally no view and room a bit dark. Rooms facing the alley looked brighter but possibly cost more. Didn't ask so if this is a concern it should be inquired about. Staff friendly and efficient and room was a decent size and very tidy. A nice stay. It was a pretty good stay in Hotel Alley. Right after the street was plenty of foods await for you to eat. Easily access to beach by foot. Except for, it located at quiet small street, but 3-5 mins will walk to main street, overall still acceptable. Centrally located hotel on a quiet side street. Less than five minutes to the beach and one minute to the shops and restaurants. Staff are very friendly and the rooms are large, modern, clean and have wifi available for free. The only negatives are no lift/elevator, bed was a little hard and restaurant has its fair share of mosquitos, otherwise and excellent place to stay for the price. European Design Hotel, Attentive & Helpful Staff (Asked for anniversary room decoration and they did it) and Close to many places - beach, restaurant, MCD etc.. I had the most wonderful staying experience in Hotel Alley. I have requested to decorate the room a little bit for our anniversary to surprise another half of me and they did it with roses in love on the bed. The staff are very helpful and attentive with all the questions from us about where to go, how to go etc. The hotel design is european style which I am so much in love. Many places in Huahin are european designs in white! The hotel is located in a small alley but quiet and safe. Only 5 min walk to beach, Mcdonald, and local seafood restaurants. There is a small night market nearby too. The best way to get around huahin will be renting a motorbike, we rented one day motorbike with 200baht and go around. Fantastic experience! Don't miss Santorini Park, Swiss Sheep Farm and Venezia! They are beautiful! lt's near to night market.Hotel is simple,clean,breakfast is jz nice.However the staffs couldnt speak English, no lift (but d staff will help to carry luggages to the rooms)n extra bed is too soft.In summary,it's worthy to stay here coz it's cheap n clean. It was a good budget hotel. Location was great which was walking distance from the clock tower and close to the night markets. The room was clean and nicely decorated. Breakfast was basic which can be improved and as with previous comments better towels could be provided. The additional bed we paid for was a rollout bed which wasn't comfortable. I will definitely stay again. The superior room type is value for money. The room is quite large so need for a while to make it cool(first when enering ,you need to adjust the air cond upto 18-20c for a while) . They have their own car park that only 100 m far from the building which is for 8-10 cars. The only annoy thing is a bit poor ventilation in the bathroom and a tiny set of breakfast but it is acceptable. Hotel is nice and cosy. Staffs are friendly and great. They provide simple breakfast which is sufficient. No lift in this hotel. You will need to carry you baggage to your room if you are staying in higher floor. Overall , worth staying ! Quite nice. But felt as if intruding on family. And they did little to alleviate that impression e.g. by talking loudly to each other across guests in the breakfast room. Little thanks or grace as we left. Room ok but slightly dull. Situation in town very good. Just stayed one night on our way south but hotel is close to the beach and bars. Hard to assess staff since we only encountered two the night clerk who seemed a bit confused and the morning cook who seemed a bit grumpy. Room was very nice: big and comfortable with a well functioning bathroom. Breakfast was the usual unremarkable Thai version of an American breakfast. I would consider staying here again if I want to be close to beach and bars. This hotel is small but just perfect if you spend the whole day out and come back to sleep. It's super clean, great location, and nice pillows. The breakfast...meehh. Even though is included... it didn't do it for us... From: day one with 2 eggs, 2 slices of bread, 2 stips of beacon, coffe or tea. To: last day with 1 sausage, 2 eggs, 2 eggs and coffee. Spend some money eating out and have a good breakfast. Again, value for money. The name is apt! It is just off the main road to the beach and 3 minutes walk to the night market. The room was spotless and the staff very helpful. Parking is 100m further down the alley. Close to everything but still quite at night outside. My only concern was that the breakfast menu was limited but the food and service was excellent. Happy to recommend. During my stay, there were full of chinese tourist which they are loud and annoying. Chinese can ruining your honeymoon trip. Also, the hotel's wall is very thin, so you can hear you neighbor talking or ....... something else during night. Personally I do not recommend this hotel. Overall a comfortable stay - as what was expected for the price paid. Clean and comfortable room and close proximity to Hua Hin town. Only downside is that the queen-sized bed is hard, ask for twin beds - they are much more comfortable to sleep on! Great little guesthouse right off the main drag. Beach is a 5 minute walk and all the restaurants and nightlife you can want another 5 minutes away. While the location is central, being down an "alley" has its perks in that its quiet and has a charm to it. The only negatives I noticed is hot shower water can be hard to find in the morning (sometimes only) and if someone is being loud in the hall, its like they're in your room. But, for the price and considering everything you get (breakfast!) its a great deal. I would definitely stay here again.